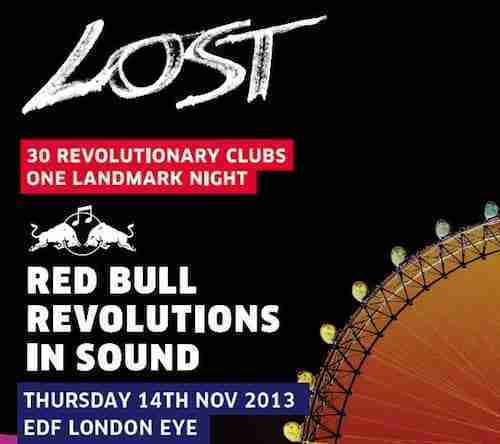 Promoters take note, always been searching for that unique spin to give your budding club night that unique twist, well Red Bull Revolutions in Sound have taken it to a whole new level by hiring the iconic ‘London Eye’ and hosting 30 simultaneous club nights, each with their own pod. This event is celebrating those innovators who have stepped out against the flow and forcible changed the course of electronic music and clubbing . Over the next few weeks we will be delving a little deeper into the philosophy, passions and motivations of clubbings game changers. So far we’ve had ‘London Warehouse Events‘ // ‘Jah Shaka Sound‘ // ‘Metalheadz‘ // ‘Cream‘ and ‘Sub Soul‘ under the spot light. Next up ‘LOST‘ talk bringing Techno to London, booking Richie Hawtin in 91, prohibition and Jazz Clubs…. Steve Bicknell and Sheree Rashit started ‘Lost’ in a Camden photographers’ studio back in 1991, spinning imported records from techno hotbeds Chicago and Detroit when few others in the UK did. Primarily based in Southwark from 1994 onwards, but also often holding events in the warehouses of the capital’s industrial Docklands region, the night grew to become a true UK dance institution with its guerrilla vibe, distinctive alien logo and ever-stellar line-ups. Jeff Mills, Basic Channel, Dave Clarke, Luke Slater and Derrick May all played, representing multiple facets of techno music. Now back from a hiatus, Lost will bring no other than M-nus front man Richie Hawtin to the big wheel. BBB: What was it that inspired you to enter the unpredictable world of putting on parties, and why do you think ‘Lost’ became such an iconic clubbing brand? LOST evolved on the back of previous nights we held. Our first party were when Sheree was producing nights at studios and galleries and Steve was a dj also producing music and promoting. Having defined the direction we wanted to take musically it was a conscious decision to progress the sound in the environment we felt complementary, deep and dark. The space, sound, lighting, sets and guests were integral to the concept. The intent, to showcase the music. The natural evolution was Cosmic Records, whereby we created our vision, primarily with releases by Steve, the artwork and titles by Sheree are symbiotic, completing the whole vision. We also release work by other artists, often under an assumed name specifically for the project. We’ve been fortunate that we’ve worked with constantly evolving artists and we’ve moved forward together, indeed Richie Hawtin, who’ll play in the LOST pod was one of our first international guests way back in ’91. BBB: Many nights fail as quickly as they start; what do you believe are the biggest challenges for a night to become and remain successful (changing trends, competitors, an ageing audience etc.)? We were fortunate in that we knew the type of music we wanted to promote and were working with people on the same mission. It was a personal adventure and we’ve seen many changes across the years. Trends and fashion tend to pigeonhole nights, which gives them a shelf life, so we’ve never tried to be popular just hoped there’s an audience that appreciate the events and line ups we present. We’ve stuck to our guns by working closely with regular guests, keeping an open mind and hopefully developing along the way. It’s great to see the next generation, some who weren’t even born when we started out, embrace the sound, that goes for audience and artists. Not forgetting that people still come who were there on day one. We hope we’d have persevered; it’s been an extraordinary journey. BBB: Clubbing & electronic music in general is very much in transition, with MP3’s, streaming, the global credit crunch and EDM all impacting the way we consume music both in a live and personal context. Traditionally clubbing and club music was an underground movement, a liberating escape for many, however it is fast becoming an exploitable global commodity. What would you like to see change in club culture (if anything), and how would you like to see it evolve over the next few decades? Previous to the acid house explosion, warehouse nights were happening like Shake and Fingerpop, Raid and soul to soul at the African centre guess this was around 86/87. On a personal, it would be great to re-create LOST in desolate ghostly Dockland buildings that people had to track down to find, as we were able to in the 90’s, unfortunately that’s no longer possible, the area is highly populated and the buildings inhabited, but the spirit survives. PreviousKerri Chandler’s ‘MadTech’ reflects on 001-010 with exclusive material and VIP edits…..